It contains an advanced phytoceramides formulation. 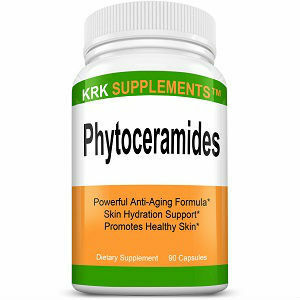 KRK Supplements phytoceramides promote healthy skin and support optimal hydration levels that protect the surface of the skin. Their potent anti-aging formula is designed to aid the health and structural integrity of the skin. What is so special about the KRK Supplements Phytoceramides formula is that it contains 350mg of phytoceramides per veggie capsule. These plant-based lipids help keep your hydration levels where they should be, which gives your skin the best protection for the long haul and keeps it healthy inside and out. The recommended daily dosage is one capsule per day. There are no known phytoceramides side effects because they’re an all-natural product. KRK Supplements Phytoceramides are $9.99 for a 90-day supply. Compared to other phytoceramides products, this is an extremely cheap price. (The regular price is 27.99 but it’s being offered at a 64% discount price) With the price being so cheap, it may make you want to question whether or not the quality of this product is up to high standards. Sometimes, sellers will promote a shoddy product at a drastically lower price in order to compete with similar products on the market. This is something you should consider when deciding if you should purchase this product. This product comes with only an “unopened bottle” return offer. You can only return this bottle if it has not been opened or used. You have 30 days to return the unopened bottle. This guarantee is not is good one because if the product does not work for you, you are stuck with it anyway. You cannot try the product without opening the bottle. however, once the bottle has been opened, you cannot return the products- even if it does not live up to to your expectations. This is something that should be taken into consideration before you decide whether or not to purchase this product. Most reputable sellers stand behind their products with a much better guarantee. When a seller has faith in a quality product, they will offer their customers a fair chance to decide if the product works for them, and if they are not 100% satisfied with the results they get from the product, they should be able to have their money refunded. Jack Webster	reviewed KRK Supplements Phytoceramides	on February 25th	 and gave it a rating of 3.